So I made another one of their favorite dishes allergy free. I made mock “Alfredo” sauce. Melted a tablespoon of butter and added a teaspoon of cornstarch to make a roux. Whisked in 2% milk (2 cups) and seasoned with Beazell’s Seasoning and garlic. Reduced until nice and creamy. Boiled noodles with fresh green beans and Beazell’s Seasoning. Tossed in sauce. 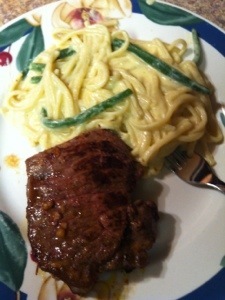 Served with a pan seared steak.